In the Beginning . . .
What made the difference? The clay! 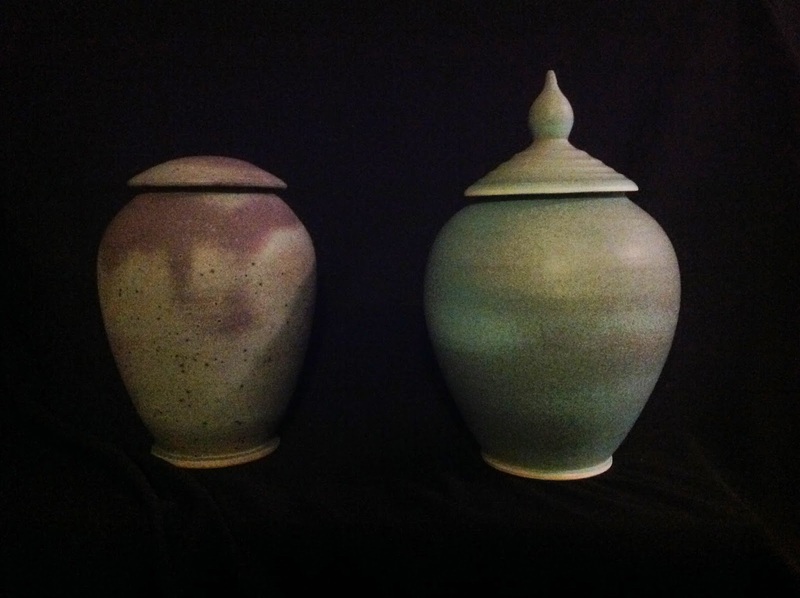 The one on the left is a speckled brownstone, and the one on the right is a white stoneware. Look for my work at Studio Adams (678 Douglas Ave., Dunedin) or at the Dunedin Fine Art Center gift shop or email me at LVAnder1255 @gmail.com -- and look for me on Facebook. Want to play with clay? Sign up for Learn to Throw at www.dfac.org. I teach on Tuesday and Thursday evenings from 6-9 p.m. Welcome to my virtual studio where you'll find info about upcoming shows, my latest clay findings, impressions about art and life -- and more! Just so there's no misunderstanding, this blog is maintained by the other half of "we" -- Anne, who listens to me ramble about my work and writes it down to share with you, our readers and followers. If you leave a comment, however, I will be the one responding. Thank you for your interest! Oh, and check out Anne's blog, Just the Write Touch. © Lee V. Anderson, Anne W. Anderson, and Formed & Fired: Creations in Clay, 2009-2014. Unauthorized use and/or duplication of this material without the express and written permission from this blog’s author(s) and/or owner(s) is strictly prohibited. Excerpts and links may be used, provided that full and clear credit is given to Lee V. Anderson, Anne W. Anderson, and Formed & Fired: Creations in Clay with appropriate and specific direction to the original content. Federal Trade Commission Disclosure: Products and/or services mentioned in Formed & Fired: Creations in Clay or linked through it to outside Web pages are not paid product placements, testimonials, or endorsements, unless specifically acknowledged in the posting. For a more detailed explanation of the FTC’s guidelines and my own policies and conflicts of interest, click here.